Following many requests from our users, we’ve now implemented the viewer’s in-world search tabs. Click Ctrl+F to open the Search window, and then click on the tab that you want to search. This tab lets you search for avatars. 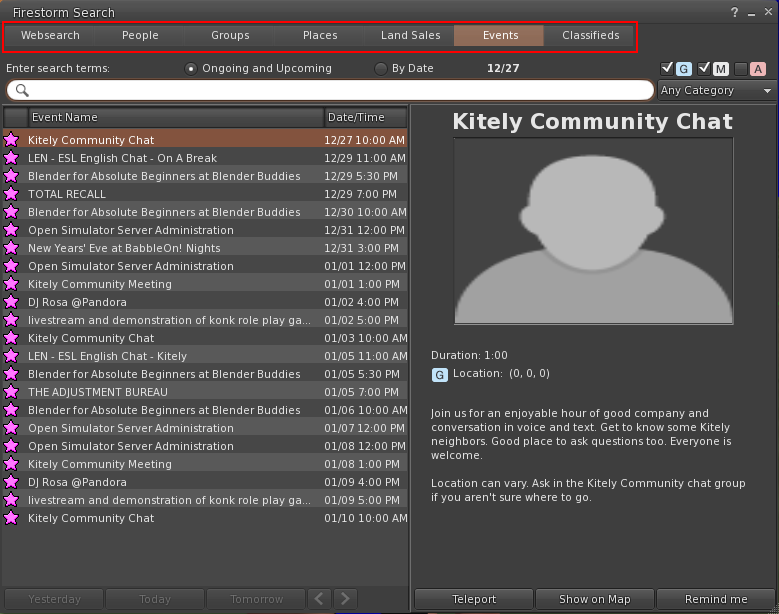 This tab lets you search for OpenSim groups. This tab lets you search for parcels. Only parcels that have enabled the “Show Place in Search” checkbox can be found (see details at the end of this post). This tab lets you search for Events. These are the events from our events system. If you’ve created an event then we highly recommend that you specify the event’s location, as described in How to Add Events. Now that people can search for events in the viewer, they will want to click “Teleport” to go to the location of the event — but that’s only possible if the event creator has entered a valid location for the event. This tab lets you search for Classified Ads. We’ve implemented a complete Classifieds system, so you can now buy Classified Ads (using Kitely Credits). Each Classified Ad runs for one week, and you can choose to have it be renewed automatically. The minimum price of a Classified Ad is 50 KC (per week). In Search, the Classified Ads are sorted by the price that the classified’s creator chose to pay for the ad: from highest price to lowest price. A few people had created classifieds in the past. Those ads have been deleted, because we didn’t charge people for classifieds until now, and we don’t want to start charging people unexpectedly. This is the only tab that worked even before today’s update, and it hasn’t changed. It still lets you search for People or Places. Note that in the “Web Search” tab, searching for places searches for Worlds. In contrast, searching in the “Places” tab searches for Parcels. 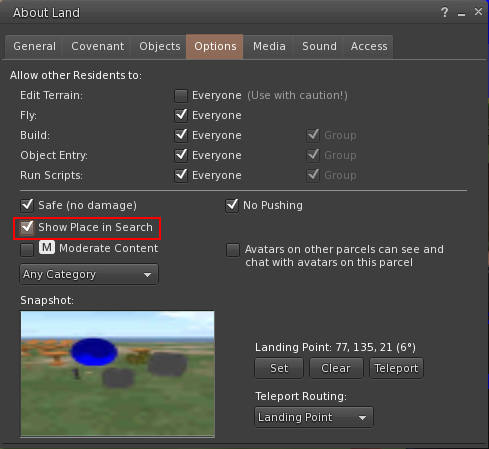 Enable the “Show Place in Search” checkbox (in the Options tab of the About Land window). Set a snapshot (not required, but recommended). When you make changes to your parcel, it may take a few minutes before these changes are visible in Search. If your region has a maturity rating of “General” then all the parcels in the region are also “General”. If your region has a maturity rating of “Moderate” then you can choose, for each parcel, whether it’s “General” or “Moderate”. If your region has a maturity rating of “Adult” then all the parcels in the region are also “Adult”. You can change the region’s maturity rating, but note that this only takes effect after the world is restarted. It’s possible to set a region maturity rating (in OpenSim) that’s different from the world maturity rating (which is chosen in the Kitely website), but this is confusing so we recommend that you keep the two maturity ratings the same. In other words, if you change one maturity rating then you should also change the other one to match. To change a world’s maturity rating, go to the My Worlds page on the Kitely website and click the Manage link next to the world you wish to change. This will open that world’s Manage World window. The option to change the world’s maturity rating is found in that window’s Access tab.